I’ve been a D&D Player for a long time, but have been without a campaign now for a few years. I’ve spoken to some friends, and there seems to be some building interest in starting an online campaign on such a website like Roll20. I started looking into options for building maps, outside of just using the Roll20 editor itself, and discovered a program called Tiled, which was exactly what I was looking for. It didn’t take me long after downloading it, to fall in love. 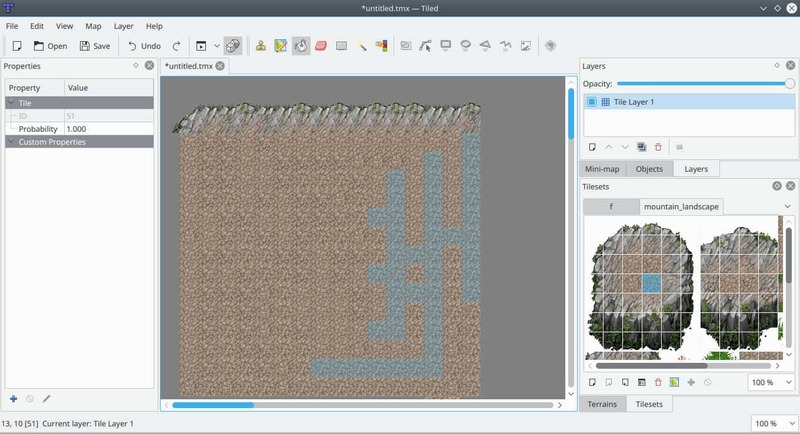 Tiled is a flexible map editor that you can use for different purposes. While you may use it to create maps for roleplaying games -- offline or online -- you may also use it to map your house, school, or any other area real or imaginative. Tiled supports isometric and orthonogal maps. Supports custom objects that you can place on the map. Custom properties for tiles support. Once you have installed Tiled, and run it, you’ll notice that you can’t actually do much. Tiled requires the use of tilesets, to build maps. You can design these yourself if you have the skill in digital art, or you can download tilesets (usually in the form of a .png) from various websites. I personally recommend Open Game Art for free tilesets. Once you have some images downloaded, you’ll want to import the tilesets via Map > External Tileset. Select the PNG image file, and voila. Using the program to design maps, is fairly easy to get the hang with, but tough to master, creating the effects of elevation (Like a cliff overhanging another platform below) can be tricky, but with practice (and good tilesets) entirely possible. Now you: Have you ever used a program like tiled, Roll20, or RPGMaker to make Maps? What others do you use, and for what kinds of projects? I started looking into options for building maps, outside of just using the Roll20 editor itself, and discovered a program called Tiled, which was exactly what I was looking for. I still think it was among the ALL TIME GREAEST game inventions ever! I will look into this stuff happily..Thanx! Thank you, Ilse! Cheers to you, too!